What's a cool/quirky nail polish look for a 30-something with an otherwise nondescript sense of style? Maybe it's just the tail end of the winter blahs, but I'm feeling antsy to try something fun and new style-wise. I've got a pretty well-established wardrobe of neutral (some would rightly say boring) casual standard stuff, and it feels like I could get a lot of bang for my style buck by trying some more daring things with my nails. I'm pretty over- and underwhelmed by what I've been able to absorb from online and print fashion sources, which seem to have a lot of teen-y patterned stickers or "nail art" ... or just boring "here's the NEW new pink" color picks. What can I try that would be unusual and somewhat fashion-forward, but not make me look 20 years younger (or older) than I am? Is the painting-one-nail-a-different-color thing already way passe? Are metallics hip or gaudy, or does it depend? Is black the new black again? Is there really no way for someone in my age group to even try to have "cool" nails? Can you recommend any good resources, or nail style muses? If it helps, I'm in a college town in the Northeast U.S. and don't have any restrictions on propriety for an office or customer service environment or anything. My nails are short and healthy and I have fair skin. I don't mind paying for have my nails done professionally, or trying things at home. Thank you! Color-change metallics (that vary in color depending on the viewing angle, much like the bicolor fabrics that were big a few years ago) are pretty cool, and I definitely don't see them a lot. I am in my late 30s and love accent nails and moon manicures. Here's a combo platter of the two that the models wore at a recent Trina Turk show. Refinery 29 is a great resource for ideas. If you run out of ideas, go to tumblr or pinterest. You will find nail photos aplenty. I'm 26 and generally always have my nails painted some crazy color (or two). Right now they're alternating gold and green (St. Patrick's Day is right around the corner, after all). I'm a big fan of alternating colors/polka dots (applied with a toothpick). I don't really follow trends and am generally pretty far behind on what's hip, but it seems like crackle polish is pretty in right now. I'm a big fan of the Sally Hansen hard as nails extreme wear nail polish. It 1) comes in a variety of really bright colors, 2) is pretty durable, and 3) is ridiculously cheap. Hooray! There's also nail polish that changes color in the sun; I mention color-change polish because it's cool in a techy kind of way and also a way to have multiple looks from a single polish application. 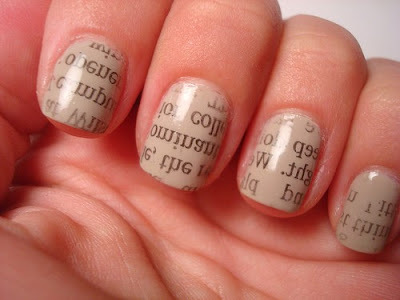 Nail polish can be pretty boring, so this adds another aspect to it. I know a 30-something who does the most gorgeous "glitter gradient' nails-- she paints the nail a solid color, then layers a clear glitter polish progressively closer to the tip. If you Google "glitter gradient nails" there are tons of examples. I haven't tried it yet, but I'm dying to! I also really like diagonal stripes with clear-polish stripes in between. Oh, and Deborah Lippman's Happy Birthday glitter is really in, but you can find plenty of cheap knock-offs that are just as neat. I think in general that glitter polish with the larger sequin-like flakes of glitter is more popular now. Grey nails are cool, too (maybe the new black?). And Essie has a lot of reds and pinks that are a "jelly"-like polish, which is an interesting finish. I have their Clambake, which is a red-orange with a really neat jelly quality. I think "colored French manicures" are great for non-kiddie, not-trying-too-hard fun nails on someone over the age of 30. I prefer the two-tone type, where the nail is one color and the tip a darker shade, but lots of people like the clear nail with (many different) colored tips. I also have lots of fun with my Nails Inc. magnetic nail polish and I'm over 40. I lurve me some marble nails, which you get by swirling different nail polish on top of water and then sticking your nail in the water. They can be pretty wild if you do contrasting bright colors, but I think they'd be more-or-less age appropriate if you did a monochrome color scheme. I recently bought a bottle of Revlon's Sparkling polish and layered it over a dark chocolate color on my toes. It's really cute! The sparkles are fun but (to me, anyway) grown-up fun rather than teenage fun. Okay, wow, I can't shut up about this, but I've also seen women paint their nails white or another neutral color, and then paint the underside of the nail (where it extends past the fingertip) a fluorescent pink, orange, yellow, &c. It sounds weird, but it glows around the edge and can look really cool-- if I find a picture I'll come back to post it. Those marble nails are amazing! And since someone brought up colored French manicures, I love this. Diagonal stripes! I'm 30, wear a suit to work everyday and when I want "color", have my nails painted the tiffany-ish blue called "for audrey" by china nails. And senior (female) execs always comment positively upon it. Get a spring color -- pale cucumber green, Easter pink, bright duckie yellow -- for your polish, and then finish with a matte top coat (instead of a gloss). You end up with fun, frosted nails that are not run-of-the-mill. Yes, the new colors. I just painted mine a rich, warm yellow. I adore it! They are not sparkly or shimmery at all, just a deep, strong color, basic shine. Greens and blues are wonderful as well. Just make sure they aren't a cheap looking hue or tone (Tiffany blue would be fabulous). I can't shut up about this either. A few more ideas. -Duochromes/multichromes (the color-changey polishes limeonaire mentions). Nubar has some good ones, ditto Ozotic and the Hits Mari Moon collection, though you're not going to find any of those brands in stores. Good drugstore multichromes are Wet'n'Wild's Gray's Anatomy and CQ Rustic Dream. Duochromes tend to be sheer; layering them over black makes them stand out while saving polish. -Nthing the magnetic nail polish. You will never stop looking at your nails. -Linear holographic polishes - these give off rainbows in sunlight! Ozotic and Hits, mentioned above, have good holos. I also love Nubar Reclaim. -Big fat chunky glitter. Milani has a great collection. -Zoya has a million great colors, and you are going to want to follow them on Facebook or Twitter because they often have fabulous promos. Right now they're offering buy 3 get 3 free (ends today, though). -The ruffian manicure looks pretty cool. -I can't stop putting China Glaze Luxe and Lush over everything. Especially pastels. Essie Shine of the Times is another good flaky glitter. -If you can manage to grab some in stock, NerdLacquer is pretty cool. Indie-made nail polish with all sorts of glitter and geeky names. -I gave myself a space manicure last week; it was surprisingly easy and I was super proud of myself. I mention a lot of harder-to-find brands, but there's so much fun to be had at the drugstore, too. Sinful Colors has good polishes in a zillion colors for $2 each, and Sally Hansen is reliably good. Revlon often has shades that are identical to more expensive brands. I can't think of any drugstore brands that are particularly bad. Scrangie and All Lacquered Up are blogs I check out when I want to see what's new. As for non-flashy stuff, dusty neutrals are still pretty big: greys, taupes, slate blues, etc. I often start out with a creme in a solid color; after a couple days when I get bored, I'll put a layer of duochrome/glitter/flakie polish on top of it and it's like a whole new manicure. I like the 1940's-style half-moon manicure in an appropriate red, which is subtle but interesting and I've actually received compliments on it. I'm similar to you (fair skin, short nails) and Essie "Shine of the Times" over light neutral opaque polish (matched as close as possible to skin tone, or a little lighter or peachier, looks AWESOME. And it's really "different" without being too "little girl glittery". I think this leopard pattern idea is pretty cool. Check Pinterest for nail polish ideas and trends. I'm really into holos right now. They're safe enough that you can actually wear them, but with a good flash in sunlight. The cheaper end of things (good formula, but not as flashy) would be Nubar's Prisms collection. The more expensive, but flashier, holographics are mostly imported, like Ozotic, Glitter Gal, or HITS No Olimpo (these are all vying for the top of my lemming list). I'll second Metroid Baby's Milani reference - they have some really gorgeous metallics. I've found that their stuff tends to be a little sheer and needs at least two coats, but it's totally worth it. Bet On Red and Bolting Blue are two nice, punchy colors. Of course, I have the taste of a magpie when it comes to makeup, so take the above with a grain of salt. I am hooked on Zoya polishes, because (with a little doctoring on my smart hand's index and thumbnail, where I get the worst wear) the manicure lasts a week. Their glitters and foils are especially awesome. I don't have the coordination for fancy nail art, but I understand that nail stamping is the in thing at the moment. Pinterest is great for nail polish ideas - just search for nail polish pins or nail polish boards. Right now I'm wearing a silver foil (Zoya Trixie) with a silver linear holo on top (a glitter gal one - don't know the specific name) - it's a really awesome combination. It looks like a sparkling silver foil in most light, but then is awesomely rainbow in sunlight. 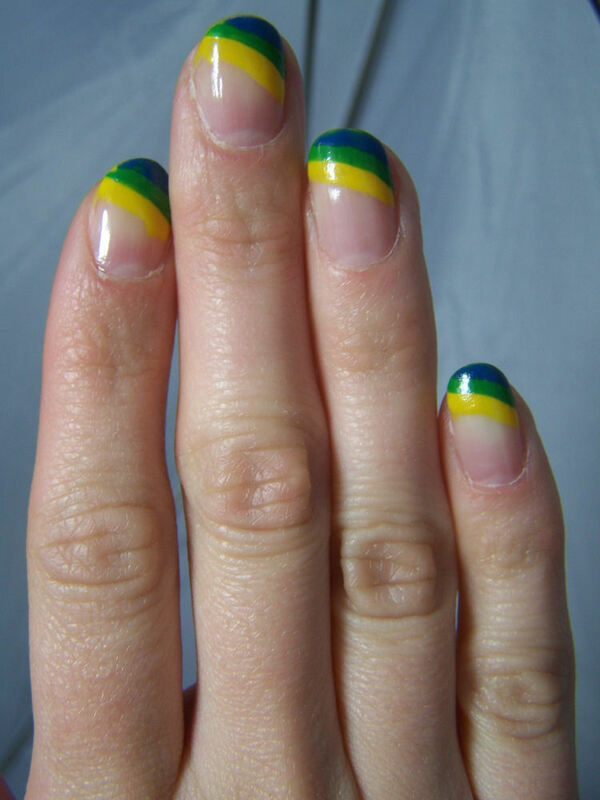 I don't think the "accent nail" thing is over; it has to be done well. I don't like, say, a blue manicure with a pink accent nail, but last week I did my nails with a grey polish, and put silver flakies on on the accent nail - I think it was subtle enough to be pretty. I would avoid "nail art" that is representations of actual things - like, you drawing pictures of tiny apples or whatever on your nails. I think it's easy to veer into tacky with this. I'd stick with abstract designs if you do nail art. Have you tried thissubreddit? I like it for ideas, when I don't want to be sucked into a pinterest binge. Jessica Quirk at What I Wore recently started a section on her blog called Saturday Morning Manicure. There are only a few styles so far, but I think they're whimsical without being childish. Some nice ideas from Jane Feltes at the Hairpin. I would love to try matte black nails with glossy black tips: fun yet chic. I imagine it would look great in blues for spring. Mint green is another colour I love for spring. I really think that no matter what your age, you can wear almost any colour on your nails as long as the rest of your outfit isn't too loud or young. It's when you get into patterns and glitter that you maybe have a problem... maybe. I lack the co-ordination for any kind of nail art, but I do like the magnetised polishes you can get now - you paint your nails then hover the magnet in the lid over the top to create a chevron effect. It looks cool while being fairly subtle. The 17 brand in Boots over here sells nice deep jewelly colours. I'd be surprised if this wasn't being done by an international brand yet. I also like the crackle top coats you can get but you might find this a bit of a young look - I paint mine blue then put the white one over for a kind of mackerel sky effect. I highly recommend Essie - their collections are always reflective of what's on-trend, they have a great formula that's easy to apply, and they're available at Target. As mentioned above, I'm seeing a lot of mint green and orange right now - you could try Essie's Navigate Her or Orange It's Obvious to be on-trendy without being juvenile. True grays are still an on-trend option if you want to be a bit more subtle (as opposed to the greiges and mauvey-grays that are over now). OPI's Touring collection had two good greys that you should still be able to find. Duo/multichromes are a fun, but still fairly subtle way to get great color. Wet'n'Wild's Gray's Anatomy mentioned above by Metroid Baby is a great multichrome color, and is a spot-on duplicate for the far, far more pricey Deborah Lipmann Wicked Game, so if you get it you'll feel like a bargain maven. My favorite duochrome ever is Chanel's Peridot which came out last year but is pretty for spring I think. Keep an eye out at your drugstore for the new Wet'n'Wild glitters that are coming out this spring. They look really fun. But be aware that glitters can be really hard to get off. 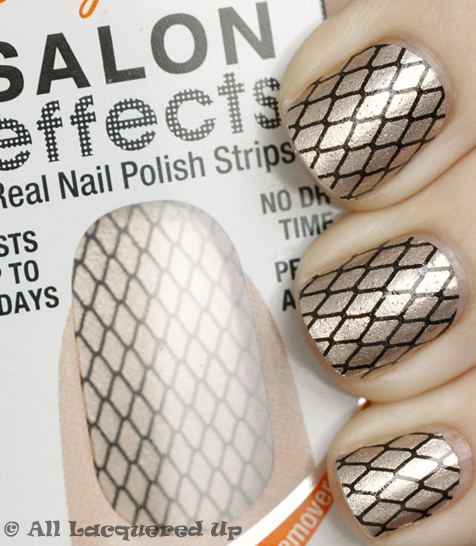 Crackle nails are over, and anything too trendy like magnetics or whatever will not be trendy for long. As far as accent nails, I agree with the others who said keep it simple with a layer of glitter or subtle stripes, rather than a contrasting color or outrageous appliques or designs. I second the recs that you check out All Lacquered Up, and google "nail polish reviews" or "nail polish blogs" for more ideas in addition to Pinterest. There's a whole wonderful world of grown-up nail polish aficionados out there, and it's fun to explore! I'm laughing about the newsprint nail art because I bought a polish that would look awesome with it months ago and still haven't tried it... and now it's passe. I'm also 30-something and have been wanting to try the magnetic polish, so it's nice to see good experiences with that upthread. Nthing the texture/glitter stuff - the glitter on tips would be great, and matte finish is also something newish and different to play with if you haven't before. I've always thought that matte nail polish was pretty cool. Paint your nails as usual and then add a top-coat of that stuff and you have awesome non-shiny nails. There are so many, many nail trends right now; you'll definitely have more than a few options. I personally love dotted nails, but here's my manicure board on Pinterest.